Mix crumbs, 1/2 cup pecans, granulated sugar and butter. Line 13x9-inch baking pan with foil; press crumbs firmly onto bottom of pan. Bake at 350¿F for 10 minutes. Beat cream cheese, brown sugar, flour and vanilla with electric mixer on medium speed until well blended. Add sour cream; mix well. Add eggs, one at a time, mixing on low speed after each addition just until blended. Place 36 caramels and 1 tablespoon water in microwavable bowl. Microwave on HIGH 1 minute or until caramels are completely melted when stirred. Add to cream cheese batter; stir until well blended. Pour over crust. Bake at 350°F for 40 minutes or until center is almost set. 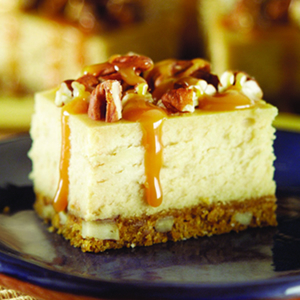 Sprinkle cheesecake with remaining 1/2 cup pecans. Refrigerate 4 hours or overnight. Place remaining caramels and 1 tablespoon water in microwavable bowl. Microwave 1 minute. Drizzle over cheesecake. Cut into 32 pieces.